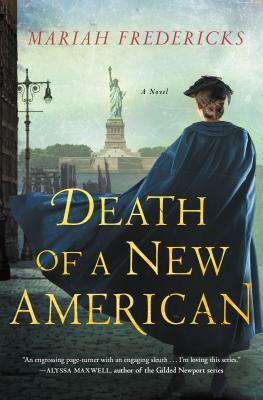 Death of a New American by Mariah Fredericks is the atmospheric, compelling follow-up to the stunning debut A Death of No Importance, featuring series character, Jane Prescott. As the city visitors adjust to the rhythms of the household, and plan Louise’s upcoming wedding, Jane quickly befriends the Tyler children’s nanny, Sofia—a young Italian-American woman. However, one unusually sultry spring night, Jane is woken by a scream from the nursery—and rushes in to find Sofia murdered, and the carefully locked window flung open. The Tylers believe that this is an attempted kidnapping of their baby gone wrong; a warning from the criminal underworld to Charles Tyler. But Jane is asked to help with the investigation by her friend, journalist Michael Behan, who knows that she is uniquely placed to see what other tensions may simmer just below the surface in this wealthy, secretive household. Was Sofia’s murder fall-out from the social tensions rife in New York, or could it be a much more personal crime? MARIAH FREDERICKS was born and raised in New York City, where she still lives with her family. She is the author of several YA novels. A Death of No Importance is her first adult novel. "An engrossing page turner with an engaging sleuth, an in depth study of human nature across social lines, and a fearless exploration of Gilded Age New York with its underbelly of poverty, crime, and ruthless politics. I'm loving this series! "—Alyssa Maxwell, author of the Gilded Newport Mysteries.